Tyra Lynne Banks is an American actress, television producer, author, television personality and former model. She first became famous as a model, appearing twice on the cover of the Sports Illustrated Swimsuit Issue and working for Victoria's Secret as one of their original Angels. Banks is the creator and host of the UPN/The CW reality television show America's Next Top Model, co-creator of True Beauty, and was the host of her own talk show, The Tyra Banks Show. Tyra Banks was born in California. She is the daughter of Caroline London; now London-Johnson a NASA photographer, and Donald Banks, a computer consultant. She has a brother, Devin, who is five years older. In 1979, when Banks was 6 years old, her parents divorced. Banks attended John Burroughs Middle School and graduated in 1991 from Immaculate Heart High School in Los Angeles. As a child Tyra Banks suffered from what she calls an "Ugly duckling" period in her life; when Banks was eleven years old she grew three inches and lost thirty pounds in three months. When Banks was 15 years old, she started modeling while attending school in Los Angeles. She was rejected by six modeling agencies before she was signed by L.A. Models and then switched to Elite Model Management at age 16. When she got the opportunity to model in Europe, she put college on hold and moved to Milan. In her first runway season, she was booked in 25 shows at the 1991 Paris Fashion Week. She would later appear on the covers of magazines such as Elle, Teen Vogue and Vogue. She walked the runways for Chanel, Valentino, Fendi and others. She has featured in advertising campaigns for Dolce & Gabbana, Yves Saint Laurent, Ralph Lauren and Nike. In the mid-1990s, Banks returned to America to do more commercial modeling. Banks was the first African American woman on the covers of GQ and the Sports Illustrated Swimsuit Issue. In 1997, she received the VH1 award for, "Supermodel of the Year." That same year, she became the first-ever African American chosen for the cover of the Victoria's Secret catalog. She was a Victoria's Secret Angel from 1997 to 2005. In 2010, Banks re-signed with her former modeling agency IMG Models. Banks is now a contributor of the Vogue Italia website. She has since started focusing on her film career and hosting her own TV show. Working with Chiandra Davis and Toni Nkhahle this Winter in Europe, sponsoring ET modeling agency. 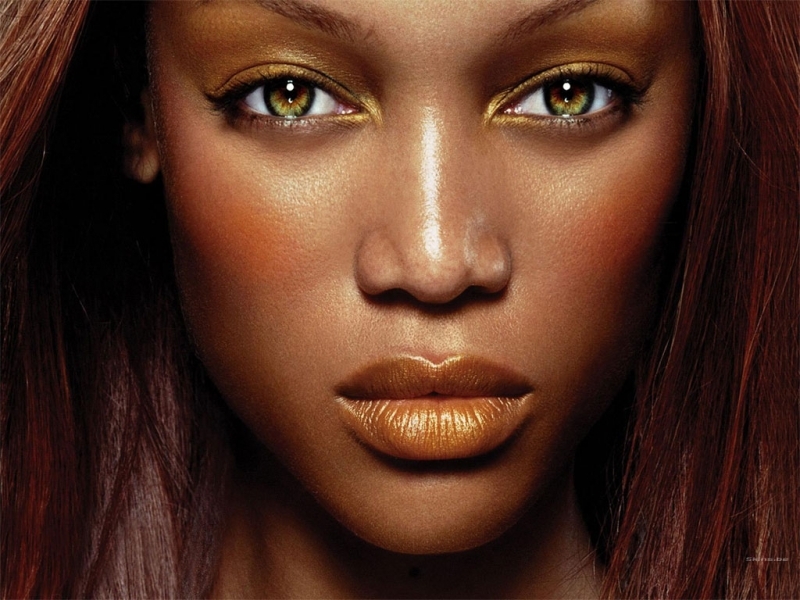 Tyra Banks shall remain a legendary supermodel, lives on and has prospered beyond all expectations. Banks's television career began on the fourth season of The Fresh Prince of Bel-Air, in which she played lead character Will Smith's old friend Jackie Ames. She made seven appearances in the series. Other TV credits include Felicity, All That, MADtv, Nick Cannon's Wild 'n Out (in which she was featured as a special guest host and team captain) and The Price Is Right (guest-starring as a "Barker's Beauty"). She also appeared as a guest in the animated talk show Space Ghost Coast to Coast in an episode entitled "Chinatown." Tyra Banks started her own production company, Bankable Productions (previously named, "Ty Ty Baby Productions"; she did not rename it until the second cycle of America's Next Top Model), which produced The Tyra Banks Show, America's Next Top Model and the 2008 movie The Clique. Banks is the hostess, judge and executive producer of The CW Television Network show America's Next Top Model. In addition, she hosted The Tyra Banks Show, a daytime talk show aimed at younger women, which premiered on September 12, 2005, and ran until May 28, 2010. In 2008, Banks won the Daytime Emmy Award for her work and production on The Tyra Banks Show, and won for the second time in a row for outstanding, informative talkshow in 2009. In 2010, Oprah Winfrey congratulated Tyra Banks for a good job done on her talk-show for inspiring and mentoring young women. In late-January 2008, Banks got the go-ahead from The CW Television Network to start work on a new reality television series based on fashion magazines called Modelitha. The show premiered on October 22, 2008. Banks's first big screen role came in 1994, when she co-starred in the drama Higher Learning. She then co-starred with Lindsay Lohan in the Disney film Life-Size, playing a doll named Eve who comes to life and has to learn how to live in the real world. Other notable roles include Love Stinks (1999), Love & Basketball (2000), Coyote Ugly (2000) and Halloween: Resurrection (2002)." She and Miley Cyrus poke fun at the excesses of the Hollywood lifestyle with a battle over a pair of shoes in Hannah Montana: The Movie (2009). Banks appeared in the fourth episode of the third season of Gossip Girl playing Ursula Nyquist, a larger-than-life actress. She also appeared on the Disney Channel show, Shake It Up as their shy school librarian. Banks has appeared in several music videos, including Michael Jackson's "Black or White", Tina Turner's "Love Thing", Mobb Deep's "Trife Life", George Michael's "Too Funky" (with supermodels Linda Evangelista, Estelle Lefébure, Emma Sjoberg and Nadja Auermann ) and Lionel Richie's "Don't Wanna Lose You". In 2004, she recorded her first single, "Shake Ya Body," which had a music video featuring the final six contestants on America's Next Top Model, Cycle 2. The video world-premiered on UPN. Banks released a single with NBA player Kobe Bryant, entitled "K.O.B.E.," which was performed on NBA TV." She also has a single on the soundtrack to Disney Channel's Original Movie Life-Size called "Be A Star." Banks announced in May 2010 that she would be writing a novel, titled Modelland, loosely based on her own modelling experience. Published September 2011, it is the first of a planned three-part series. On an interview with Good Morning America, Banks stated that Modelland is the story of four girls who are accepted into an "exclusive" modelling school in the world of Modelland. Her first novel, Modelland, hit the New York Times best seller list in October 2011. In 1998, Banks co-authored a book entitled Tyra's Beauty, Inside and Out. In March 2011, Banks launched her fashion and beauty website called "typeF.com", which she co-created with Demand Media. In 2011, Banks enrolled in the three-year-long Owner/President Management Program (OPM) at Harvard Business School. Admission to the program, as described on HBS's website, "is a selective process based on professional achievement and organizational responsibility. We look for professionals who have demonstrated business talent and leadership potential." Banks graduated from the Executive Education Training Program in February 2012, earning a certificate. Tyra has come under intense criticism for implying she was a Harvard "graduate." A biting article in Jezebel referred to her statements on Harvard as "disingenuous," and called upon her to "stop lying" about Harvard. Harvard's own newspaper, The Harvard Crimson, was critical of Tyra's public statements about "attending" Harvard. Despite the harsh criticism, and the conclusion of her time as a HBS student, "Banks will be remembered within the HBS curriculum. Professor Rohit Deshpande is preparing a case study on Bankable Productions, Banks’ independent film and television production company, to be incorporated into future coursework for the Executive Education Owner/President Management Program." as cited on a different, and much more positive, article on The Harvard Crimson. According to HBS Harbus, Harvard Business School's newspaper, on February 14, 2013, Tyra spoke with Harvard Business School Professor and Senior Associate Dean Youngme E. Moon in front of select audience at HBS. More than 100 students and faculty were invited to attend the event and hear Banks speak about her business and the reasons behind her decision to attend the program. Banks was romantically linked to musician Seal, film director John Singleton and actor Will Smith in the 1990s. She dated basketball player Chris Webber from 2001 to 2004. She is known for being outspoken on abusive relationships, having been a victim herself. In 2005, when asked about her relationship history, she stated, 'I won't be using a lot of names [on the show], but a specific relationship had not just cheating but emotional abuse. It was really bad, but that made me strong.' In 2009, she opened up about her past abusive relationship when she made a guest appearance on The Oprah Winfrey Show, hosting alongside Oprah Winfrey. The episode was dedicated to dating violence in response to the assault of Rihanna caused by Chris Brown.